Wikis are prone to develop in unpredictable ways. Instructors rightfully worry about uncontrolled posting in their Wikispaces sites, because it can lead to difficulty when trying to assess an individual student's effort. Fortunately, instructors can simplify this assessment by considering some of the methods presented below. The easiest - albeit the least effective - way to evaluate student work within a wiki is to measure participation by numbers. 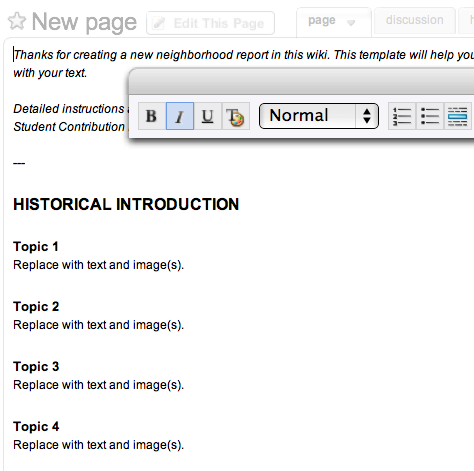 Using this method, students are given credit for posting to the wiki, not necessarily for the quality of their work. The instructor can simply peruse the "Recent Changes" section of the wiki and note which students did (or did not) alter wiki pages within the prescribed time period. Whether or not this is the only way you are evaluating your students, you should stress to them that their participation in building a class wiki is part of their final grade. Student participation and contribution increase significantly when posting counts toward their grade even in a small way. By requiring regular participation and occasionally quoting student work from the wiki in the classroom, the instructor can reiterate the importance of the work happening in that space and tap into a good source of classroom discussion topics. Instructors can spur student investment in the project by asking each to comment on another student's page by editing the page directly or by using the "Discussion" tab that appears at the top of each page. In some cases, a discussion that starts in the wiki can invigorate in-class discussion, since it requires students to consider the subject at hand from another's viewpoint prior to the class discussion. Some tips for successful student commenting on a wiki: spend a little time defining appropriate tone, encourage comments that reference other pages in the wiki, and suggest that page authors opt to 'watch' their page (if they use the "notify me" option, they will be alerted by email whenever their page attracts comments). An instructor can comment on wiki pages just as easily as students. 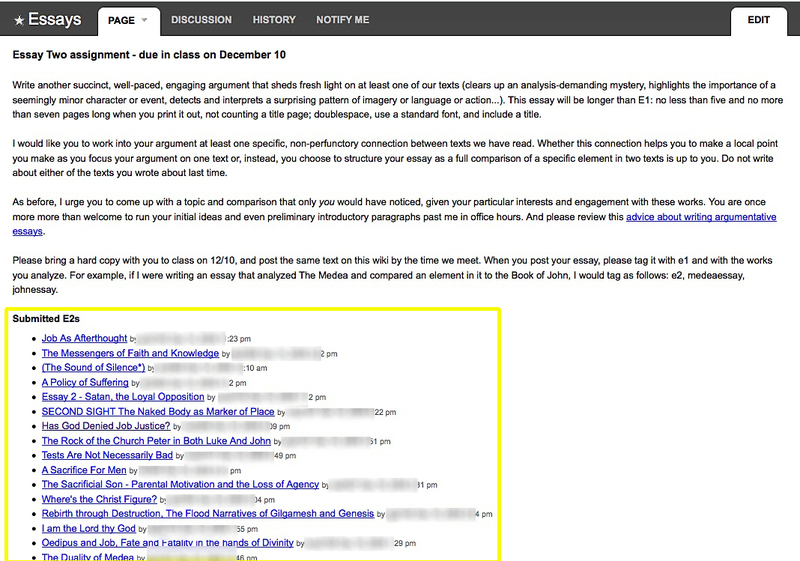 Since each student's work on the wiki is visible to the rest of the class, you should consider whether or not you want your feedback to be visible to the entire class. Evaluations that are visible to the group significantly increase attention to peer work. Outstanding work can be easily highlighted and held up as a model. Of course, open evaluation of student work is not always appropriate and should be handled with care. Here are some ways to respectfully implement an 'open' evaluation model on your class wiki: restrict access to the wiki to only enrolled students; withhold actual grades and post only comments; limit posted comments to only the strongest (A-level) work; ask the class to vote (confidentially) for or against instructor-posted evaluation, with the understanding that public feedback will only happen if all students agree to that arrangement. The History tab appears at the top of each page in a wiki. Clicking on this tab displays a list of all of the changes that have been made to the page, registering when the changes were saved and who made them. The History tab can help you ensure that students meet their deadlines; since every change on a wiki is timestamped, you will be able to see if students posted their work on time. The History tab of a group's project page can tell you if one member posted the majority of content on the page or if the division of labor was equitable. Note that mere posting isn't always a reliable guide to participation: a group may have shared research and writing tasks, but agreed to delegate posting to one of its members. Therefore, group assignments that specify individual responsibility for discreet sections of a project (as discussed above in the Adding Some Structure section) may help you better evaluate actual participation in a group project. Within the History tab, you can compare two versions of a page. This feature can be especially useful if you do line-level editing or if students develop a project page over an extended period. To compare two versions of a document, click on the two corresponding "Select" buttons in the page's history tab. 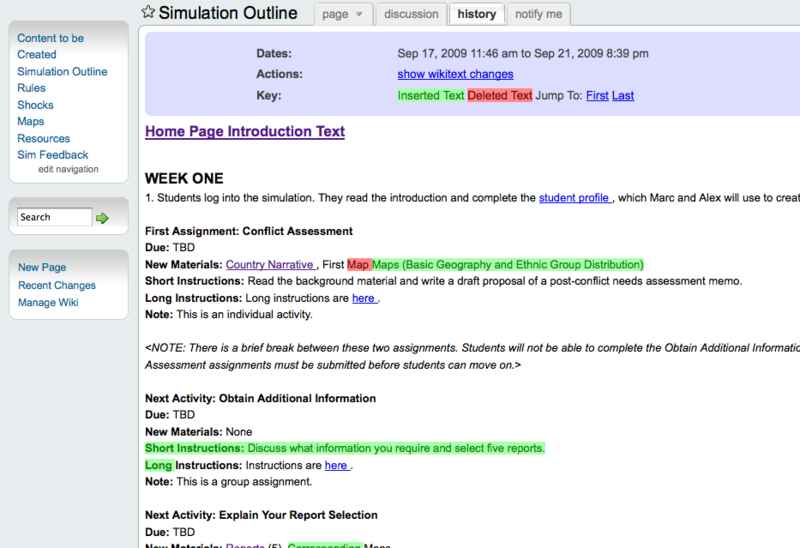 The resulting comparison page will look like the screenshot below where text that was added is highlighted in green and text that was deleted is highlighted in red. Though the URL in the address bar is quite complicated, the comparison page's Web address can be a useful tool: you can take that address and make it available to your students in order to highlight a specific set of changes in a document or particular moment in the editing process. Finally, Wikispaces offers a range of tagging and Really-Simply-Syndication (RSS) feed configurations that can help you track submissions for specific assignments. An instructor's assignment page can include a RSS feed widget that will automatically list all of the pages in the wiki with a designated tag; this list may be configured to include the tagged page's author, its creation date, and its latest revision time. Suppose you post an assignment asking each student to create a page that displays and analyzes a pertinent image prior to the next class meeting. As part of this assignment, instruct your students to tag their pages "assignment1". You can then use Wikispace's RSS feed widget in your page to automatically generate a list of all other pages in the wiki that are tagged "assignment1". This way the work that students do in the wiki for this assignment immediately appears directly below the assignment description. Not all of the features associated with RSS feeds are represented in Wikispaces' RSS feed widget. For example, the feed's title can be controlled by a hidden "title=" field. An educational technologist can advise you how to configure tag feeds so that they effectively meet your needs. Given some forethought and structure, wikis need not be a headache when it comes to assessing student work. If you need assistance implementing any of the techniques outlined in this primer or if you would like to brainstorm your wiki-based assignments with an educational technologist, please contact the Columbia Center for New Media Teaching and Learning to set up an appointment.